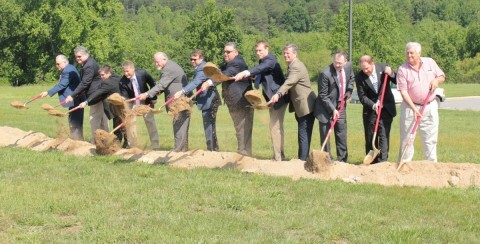 BLAIRS — Work has officially begun on a rural internet project in Pittsylvania County after a groundbreaking ceremony Friday morning at the base of White Oak Mountain. Pittsylvania County Economic Development Director Matt Rowe hosted the groundbreaking next to Bojangles on U.S. 29 in Blairs. Warren said he was excited about the possibilities for students wanting to take online classes and entrepreneurs wanting to run businesses out of their homes. “The implications of this lengthy project will be truly limitless,” Warren said. County staff also thanked Bill Rogers, a native Pittsylvania County resident, who allowed the event to be held on his property and provided an easement for a tower to the county for free. The board signed a tower lease with SCS Broadband in January that allows the company to put its equipment on county-owned towers. This agreement also brings a small revenue stream to the county, while still providing internet service to rural areas. Mid-Atlantic Broadband planned the route for the fiber optic line on White Oak Mountain and is planning to add that network to its open access fiber network. Residents near White Oak Mountain should be able to receive service from SCS Broadband by August, weather permitting. SCS also will be working with Pittsylvania County Schools and the county’s volunteer fire departments to utilize “any tall objects” to get the best service possible for the county. SCS hopes to have all towers outfitted with equipment in 12 to 18 months, according to Rowe, with a new tower completed every month. “It’s days like today when we know the best is yet to come for Pittsylvania County,” Del. Les Adams said.